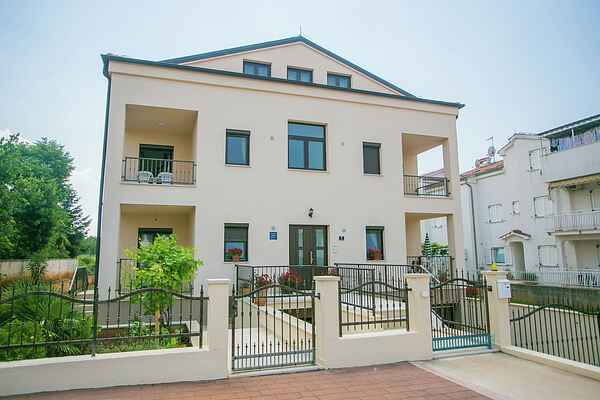 Spacious and newly furnished apartment with balcony in Veli Maj. It spreads over two floors ( first and second floor ) and consists of three bedrooms with double beds, a kitchen and a large living room from which you have access to balcony, a bathroom with bath tub and a bathroom with shower. The kitchen is fully equipped with electric stove, oven, refrigerator with freezer, toaster and coffee maker. The apartment has free wireless internet, air conditioning in each room and satellite TV. Bed linen and towels are included. Laundry service can be provided by the owner in the private laundrette in the property at an extra cost payable on site. Pets are not allowed. Private parking is available in front of the house ( one place ). New pebble beach on St. Martin bay, is located only 800 m from the apartment.